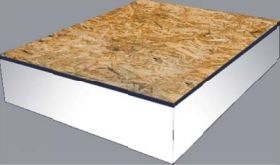 Nailbase Panels are comprised of a single layer of 7/16” OSB laminated to the expanded polystyrene (EPS) rigid insulation. Because there is only one layer of OSB, Nailbase Panels are not structural and can only be used where there is an existing structure in place. Originally created for use on roofs, Nailbase Panels are now used on the walls in either residential or commercial applications. 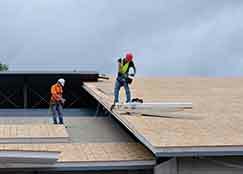 Using a standard nail or screw fastener, Insulspan Nailbase Panels easily attach to an existing roof or wall structure. Then, the outside layer of OSB creates an even surface to which exterior cladding, roofing materials, drywall, or other types of finish materials are easily attached. The Nailbase Panels come standard in five thicknesses to match standard dimensional lumber. However, they can be manufactured in a custom thickness to meet your individual needs. Offering the same continuous core of EPS insulation as Insulspan SIPs, Nailbase Panels can incorporate EPS or our R-Plus EnerSpan® insulation. Learn more about the R-value of Insulspan Nailbase Panels in Product Information Bulletin 219. Nailbase Panels are often used in remodeling projects where increasing the energy efficiency of the building is the goal. Because of their non-structural nature, they are easy to add to a building’s roof or walls when replacing the exterior cladding. Nailbase Panels are also useful when space is limited such as in areas with vaulted ceilings. 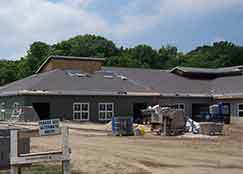 The images below show the progression and details of adding Nailbase Panels to the roof of the Black River School. The panels are installed directly over the existing roof structure. Then, the asphalt shingles are installed on top of the Nailbase Panels. Another application for Insulspan Nailbase Panels is in pole barns between the structural posts. Have a pole barn with steel structural posts? 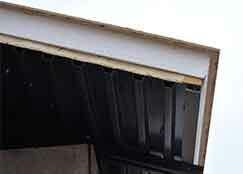 Not to worry; Insulspan Nailbase Panels can attach to that building material as well.